Alex Campbell on wedding day in 1914. The Rockhampton Historical Society holds the following document written by an un-named person who interviewed Alex Campbell (pictured) about coal mining in Central Queensland. In view of the greatly increased interest which is being taken in the exploration of Central Queensland Coal Treasures, and the recovery of coal in Central Queensland. In view also of the immense importance of coal at some point in all industrial activity, here and elsewhere, it seems quite fitting that this Society should take note of, and record something of the history of coal mining and coal recovery in the District. In passing it may be noted that it is the fashion nowadays when the resources at Central Queensland are being canvassed to speak of the 'Potential' of the District. This concentration of notice on the 'Potential' of the place is unfortunate, as it tends to lose sight of the fact that 'potential' is the other kind of energy. It would be a good thing if we could translate more of this talk of potential and potentialities into kinetic activity - as far as this part of the State is concerned. As an introduction to a fuller consideration of the History of Coal Mining in Central Queensland, we as a Society are fortunate in having been able to secure a great deal of valuable information from Alex Campbell retired and now living in Rockhampton. Mr Campbell was for many years a Mine Manager, in charge of mining operations in various parts of Queensland, principally in Central Queensland, dealing chiefly with coal mining. His other activities included considerable work in road construction in various parts of the State. Approaching the presentation of the vast fund of information which Mr Campbell has made available, it is necessary to make two points clear. In the first place it has been imperative to bring all of this information down into the limits of a comparatively short paper, and in the second place it is desirable to retain as far as possible the biographical point of view. In short, to recognise the 'Story' in this history. Out of Mr Campbell's reminiscences we have emerging a fairly clear picture of some important phases of Coal Mining in Central Queensland, over the past sixty years. Mr Campbell was born in Scotland in 1879, leaving there with his parents when he was four years old. He relates a very vivid story of the trip out to this country, telling of the severe gales experienced in the Atlantic Ocean lasting for several days and causing a great deal of anxiety. He has also interesting memories of his early days in Brisbane - living as a young lad in Brisbane where the Town Hall now stands. (It seems likely that Alex lived at Hutton Lane, Brisbane because his mother died two weeks after the family arrived from Scotland. His father David remarried within 12 months to a woman whose address was Hutton Lane. It appears that while David was working at Ipswich, he may have at least on of his three children with his eventual second wife, Christina Abel. As it happens, Christina was also aboard the Southesk with the Campbell family on the journey to Australia). He tells of the occasion when a women drawing water from a well in the vicinity, called all the neighbours to come and see the biggest worm she had ever seen, which proved to be a black snake. After the snake had been inspected, the woman quite unconcernedly brushed it from her wrist and arm, back into the well. Mr Campbell’s mining activity commenced towards the end of last Century, during the year 1893, at Ipswich. Later he was at Chillagoe, somewhere about 1905-1906 where he knew E.G. Theodore, Bill McCormack and other men later to become prominent in the Public life of Queensland, and in fact in the Public Life of the Commonwealth. We are more concerned here with the fact that early in this century he was at work in the Fitzroy Basin, when he was 22 years old. He was engaged with his father Mr David Campbell, working for the Mammoth Anthracite Coal Company _ a Company having its headquarters in Adelaide. A Mr R.D. Graham was manager in control of the operations. The famous Dr Jack was also at this field while mining operations were proceeding. This work was carried out on Blackwater Creek, three quarters of a mile south above its junction with the Mackenzie River. (This must be close to where the Jellinbah mine now operates [as of 2015]. It may even be the same workings). From the first shaft sunk here, to a depth of 68 feet, 32 tons of coal were mined from a seam 20 feet thick. After appropriate tests this proved to be a good steaming coal. Some of the men who worked the Mammoth Anthracite Coal's operation near Bluff in Central Queensland from about 1905. 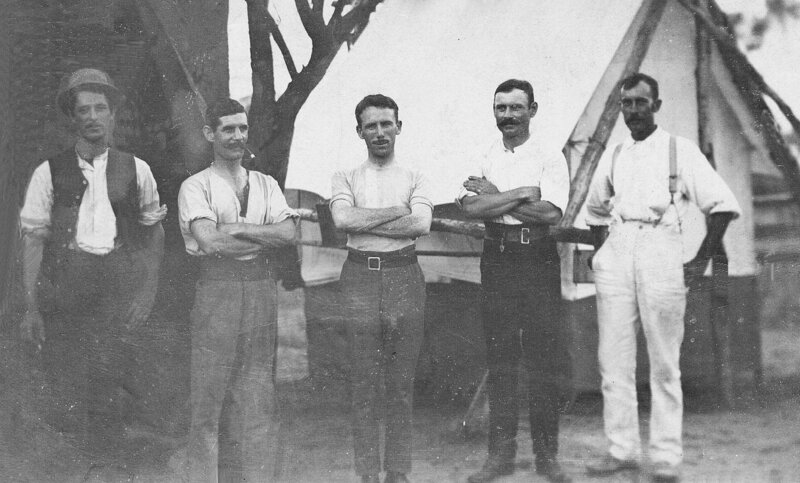 Second from right is Alex Campbell and beside him is his brother-in-law Arthur Nunn (far right). While operations were proceeding on this field, Mr Leason a coal expert from London visited the mine to inspect it and to report on the quantity of the coal. Later, Mr Leason opened a colliery in Western Australia. During exploratory work in this vicinity a human shin bone had been unearthed. which was taken to London by Mr Leason for examination and preservation. This marked the grave of a man said to be a minister’s son, and it was said that the stone had been sent out from England. It was at this crossing that the murders of the men escorting the gold from Clermont, were perpetrated by Griffin. Above this crossing there lies a waterhole four miles long, said to be 70 feet deep, this contained plenty of water after a very long drought in 1902. With an appropriate dam, another few miles of water could be impounded. Here, water and coal are available in quantity within a couple of miles of each other. This is a possible site for a Power House, the establishment of which would present no serious problems of working or transport, and which could give a tremendous impetus to rural development in this district. In 1907 a second shaft was sunk for the Bluff Coal Company under Mr Campbell’s direction. upon the same seam as that which had been tapped earlier at a different point by the Mammoth Anthracite Coal Company. From this shaft a parcel. of 100 tons of coal was carted into Bluff. A third shaft was sunk in 1909 on account of the Smokeless Coal Company. This yielded 220 tons which, when tried out by the Admiralty, proved to be an excellent steaming coal. The delivery of this coal to Blackwater involved Mr Campbell and his men in a great deal of trouble. Five miles of road, over rough country, including a crossing of Blackwater Creek, had to be constructed. In the transporting of this coal, bullock teams had to be used which slowed down the work of delivery. An attempt to carry out the work of carting the coal by mechanical means, (a tractor engine with two trailers was used) caused further trouble. To procure materials for repairs to the machine, a tramp of about twelve miles over very rough country had to be undertaken with the added problem of getting the parts to the machine after they had been procured. In 1911, when Mr Benjamin Magnus was manager at Mount Morgan, a young engineer, later to become prominent in the development of Mining in Central Queensland in the person of Mr A.A.Boyd, came out to inspect the several coal fields in this area. As a result of his visit diamond drilling of country following the strike of the coal seams was introduced. This drilling activity developed to a great extent, and for three years intensive work was carried out with two drills operating. Work commenced at Midnight on Sunday and continued in three shifts until six PM the following Saturday. During Mr Campbell’s activities in this area from one particular location excellent indications of the presence of oil were obtained. This very important phase of the story cannot be elaborated here. Except that it could be said _ in the way of editorial comment _ that the immense importance of oil discovery would seem suggest that exhaustive tests might well follow any clear indication of oil in any part of the State. In 1916, Mr Campbell continued his association with Mr Boyd and the Mount Morgan Company, and commenced operation in the Dawson Valley a couple of miles above the site of the present town of Baralaba, on the Western side of the River. Here he and his men had some strenuous experiences with floods. Operating from Rannes over very rough, almost non-existent, road including a crossing of the treacherous Woollin Creek, near Rannes, serious trouble over a considerable period or time was encountered. Fortunately while there was plenty of very real hardship, there was no loss of life. Coal from Baralaba was used at Mount Morgan and in the Railways. It is interesting to record here that mining and exploration work is still going on at and around Baralaba. About 1925, Mr Campbell continued his association with Mr Boyd and Mount Morgan. Carrying out work in connection with the development of the open cut method of operating, introduced at Mount Morgan by Mr Boyd. This open cut method of mining has had a tremendous impact upon the life of the mine at Mount Morgan and the stability of the Town. In 1927, Mr Campbell changed his occupation for a time and was engaged in road construction as an Officer of the Public Estate Improvement Organisation, commonly known as the PEI. This organisation did a great deal of good work but to avoid overlapping, was later absorbed or superseded by the Main Roads Commission. Mr Campbell was first stationed in the Callide area working towards Monto. The Callide Field, of great and growing importance, first discovered in 1904 was inspected by him during the period he was engaged in road construction in the area. Among his more interesting reminiscences although they have only a subsidiary interest as far as coal is concerned, are the vivid recollections he has of some of the hardships endured by the inexperienced men he had working with him. These reminiscences include the fact that a considerable number of people, men and women, were on one occasion marooned for some days in Rannes (with very little food) on account of flood waters, preventing the train they were travelling on proceeding over the dangerous river crossing ahead. After the Callide period, Mr Campbell spent a considerable time working out from Mackay on road construction in the Eungella Range area. And later again at Cardwell. These areas _ the Callide Valley, Eungella and Cardwell _ are all fairly well provided with roads now. But these areas, had practically no roads in the Thirties during the Depression period. It is fashionable to look upon the work of the PEI which was handled by the Department controlled by the Hon. P. Pease (who represented a Northern electorate in the Queensland Parliament) as being amateurish. But a great deal of very useful development work was carried out by this organisation, the Chief Engineer being Walter Bevan and Charlie Thomas. After Cardwell when Mr Campbell was asked to go over to Tennant Creek, he decided to call it a day. But from that point on and continuing today, the large volume of information which Mr Campbell has accumulated relative to coal working and other matters, is at all times available when it is sought. No story of the Coal Measures of Central Queensland would be complete without some reference to the existence of considerable coal beds at Byfield. This coal was discovered by a member of the Ross family, other members of which family held Taranganba, Mulambin and later lived in Yeppoon, Rockhampton and Mount Morgan. Comparatively recently, attempts were made to work this coal. Mr Paul Tardent, Mr Austenfeldt, Mr. C.H Ross and Mr Reynolds, with others were interested, but operations did not continue. The foregoing story contains no mention of the extensive operations going on at Blair Athol (near Clermont). The discovery and development of this field would require another chapter on the long and interesting history of coal discovery and coal mining in Central Queensland. Mr Campbell played some part in the early work on this field.